Taxidermists use it to clean and whiten bones…..
Now, this is kind of wonderful, really. Right there, H2O2 is very practical to have around. Do you find this all funny and intriguing like I do? Are you curious to learn more? But there’s more to it -- hydrogen peroxide also has a wonderful quality of being good for the environment. This benefit goes deep and wide. It is good for rivers, it is good for plants, and it can be used to replace chlorine bleach, ammonia, and other chemicals which are harmful to rivers and plants. Chlorine in pools is unpleasant and irritating to many people. For some this is a minor nuisance, for others it is a real hazard. Hydrogen peroxide can be used instead, and is non-toxic. Likewise household cleaning products containing chlorine can be upsetting to household cats and dogs – it smells like urine to them, as well as being unhealthy when they lick it off of their skin and fur. It all starts to blend together: H2O2 is good for people, animals, plants, rivers…… and it breaks down into water and oxygen - what could be more non-toxic? Going one step farther, H2O2 is part of the earth’s cleaning cycle. It is formed as water (H2O) passes through the ozone layer (O3) where it picks up another oxygen atom (O), becoming H202 (hydrogen peroxide). So, a bit of it comes down to us in rain. When you water your plants with the garden hose, there’s no hydrogen peroxide in that water. Adding a little hydrogen peroxide to plant water is great for the garden (indoor plants too). The runoff won’t harm streams and fish the way that many garden fertilizers do. I'll have more to say about all that. Is this story getting interesting yet? And is it starting to sound a bit repetitive, too - like one big story applied to many different things, in a big circle from people to plants to water to fish to sky? You may be here because you already know lots about the usefulness of hydrogen peroxide, and you're "a fan"! Welcome! I hope you can find some new uses, some new info, and some food for thought here. This site is called "Using Hydrogen Peroxide" because I think that USING peroxide is what is most, well, useful! It's where it matters -- in practice rather than in theory. It's being able to use peroxide where the benefits are. The practical applications are were we can really dig in and try things, and apply the ideas in real life. And we can all try using H2O2, within some safety limits! Would you like to try using hydrogen peroxide? What new applications can you find to try out? AND: If you have already used peroxide for years, I hope you'll also consider sharing some of your experience with others here. There are lots of interesting stories about peroxide. Okay, what about the “bird man of Alcatraz”, who, it is said, used it to heal birds? Is it true that some famous healing springs have higher-than-usual levels of peroxide in their waters? Some people say it has other health benefits for people, and even for farm animals ... is that true? What does the FDA say about it? And does Health Canada agree? Did you know that it was used in World War II to fuel catapults and rockets? I’ll try to get to the bottom of those stories, too. .....finding ways to USE peroxide that provide benefits for ourselves, our homes, our families and others... and benefits for animals and our world. Whatever we use hydrogen peroxide for, let’s keep it fun, creative and joyful – in that spirit of non-toxic growthful life and health for water, animals, plants, and housecleaning….. Note: Hydrogen peroxide is also called H202 -- that's its chemical name -- both terms can be used interchangeably. I understand you'll use my information to send me newsletters. No worries! Your email will be used ONLY to send you newsletters. 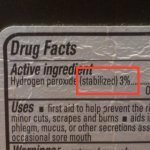 What's the deal with Food Grade Hydrogen Peroxide? What is it? Does it matter? Learn about stabilizers, grades, uses of food grade and other grades of HP! There's such a variety of commerial hydrogen peroxide uses: bleaching foods, treating waste water, improving crop yields & more. For some links, I receive ad commissions, at no cost to you. More info here. Note: Products shown are sold by Amazon. This site does NOT sell hydrogen peroxide.